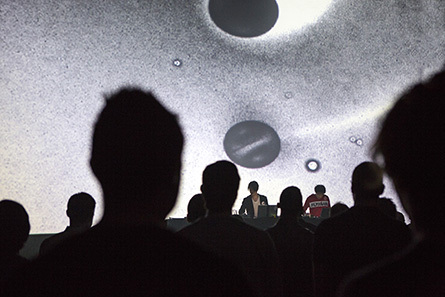 Nicolas Bernier inaugurated the fourteenth edition of the Elektra Festival at the Usine C with the performance “Frequencies (a)”. 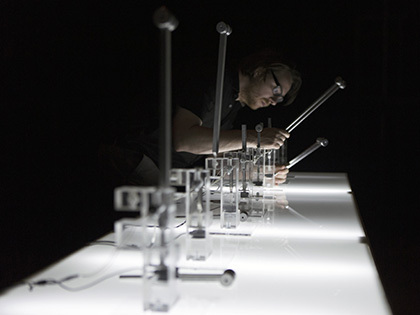 The Montreal performer prepared a table earlier on by placing eight translucent devices that he had prepared to play on. They were all linked to the computer that controls them by activating solenoids that alternately strike tuning forks. Everything here, from the transparency of the objects to the harmony of the pure frequencies evokes the scene from Federico Fellini’s “And the Ship Sails On” when a musical concert of resonating glasses is improvised in a kitchen. But the Quebecois artist orchestrates alone this musical instrument, of which he is also the maker. And the ‘la’ frequencies that the artist generates live with other tuning forks are added to the musical composition controlled by the machine. Each evening the performance is thus diversely enhanced as the artist intervenes in the white lights that harmonise perfectly with the successive or collective activations of the apparatus. 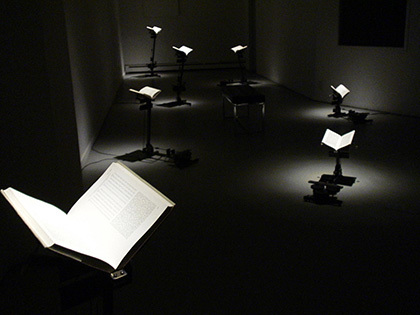 If one had to isolate an aesthetic thread common to many of the audiovisual performances of this 2013 Elektra, placed by its Artistic Director Alain Thibault under the sign of antimatter, it would perhaps be that of stretching. The endless stretching for example of the music of Mondkopf whose echo reverberates right through to the reconstructed eclipse made by the members of the Trakik collective where the sounds gradually accumulate in uninterrupted flux, appearing to us as numerous as the particles of a recreated sun. And there’s the question of another form of stretching during the performance “Massive Data Flow” by Keiichiro Shibuya and Takashi Ikegami, where we observe the evolution of living cells that a stretching, via a zoom, ultimately reveals. From one evening to the next we thus move from the infinitely big to the infinitely small, but the sounds of the Japanese performers also accumulate in uninterrupted flows whose power is comparable to that of a maelstrom. These performances have beginnings and endings, but time between the two seems endless. Performances follow one upon the other at Usine C, while at the Phi Centre it is presentations by the participants of the International Digital Arts Market (IDAM) created in 2007, that succeed one another. It is an opportunity for a few artists, such as Canadian Robyn Moody, to talk about the state of their research. His most recent robotic installation, which he still considers to be a work in progress, is entitled “Butterflies”. It brings together the books of various authors such as Copernicus and Darwin whose thoughts disturbed in their time or are still disturbing. But the mechanical apparatus, of which they are an integral part, seems to have freed them from the burden of past or present obscurantism. The flutter of their pages is comparable to the wings of a butterfly, which symbolises, like all winged creatures, liberty, because they can escape terrestrial forces. But butterflies also incarnate metamorphosis, which makes us think of the inevitable evolutions in society, which consequently can only be slow because it took time for Copernicus’ ideas to be accepted while those of Darwin are still being debated by creationists. Elektra, also has partner events like the one entitled “Ex Vivo” organised at the Occurrence Gallery by the exhibition’s curator, Aurélie Besson, who presents the research of two artists belonging to the group Perte de Signal: Sofian Audry and Samuel St-Aubin. They conduct little experiments featuring every day objects that look like ready-mades. There is an element of the absurd in the decanting of the same volume of water from bucket to bucket, or accident in the mechanical passing of an egg from one spoon to another. The works of this artist inventor, like all artist robots, fascinate us to start with, by their uselessness. Though they do mark time, like this cup of tea that spins on a device that elevates it while depriving it of its use. 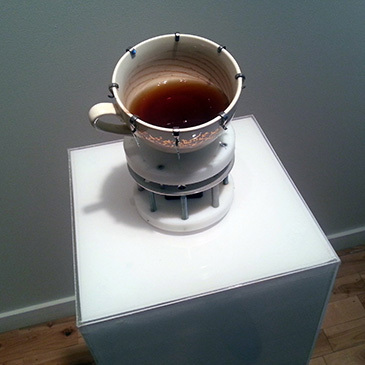 The drink evaporates leaving concentric circles forming in the bottom of the cup that the artist methodically photographs as a scientist would to document their experiments, without being concerned in the least by what might be made of the readings or interpretations. 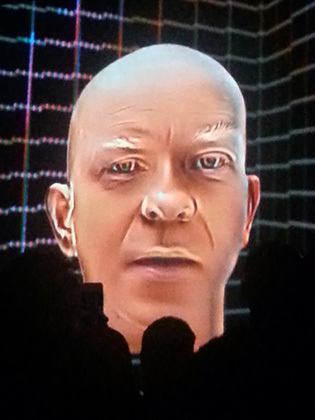 The celebrated ZKM in Karlsruhe, Germany, was invited to the Goethe-Institut in Montreal to participate at Elektra, bringing with it the playful prize-winning video works of the AppArtAwards 2011-2012. During the opening, we played more than we commented. And if there is a touchpad application that can generate a scramble, it is that of Rafaël Rozendaal, whose creations on line reveal a relatively radical side. 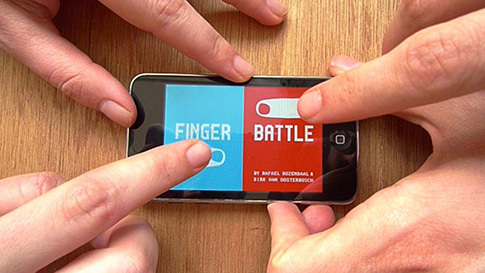 The game entitled “Finger Battle” is extremely simple, as the players must tap the screen to increase their respective territories until only one remains. Speed, not to mention jitteriness, wins the day over any kind of strategy or skill. “Finger Battle” is all the more minimal if we omit the “chromatic richness” of its two monochromatic tints than, ”Tennis for Two”, a game for oscilloscopes created in 1958. But we had to wait for tactile tablets to appear so that artists like Rafaël Rozendaal could make use of them. There are of course a myriad of comparable games to “Finger Battle”, but it is the museum context that confers rarity on its emergence. There is also a question of research in art when the participants of the IDAM are invited to visit the labs of Concordia University and the UQAM, both members of HEXAGRAM CIAM. And it is thus we discover the creations of Caroline Bernard and Michiko Tsuda. The project is entitled “Journey” and works around a few dolly shots filmed previously in the universe of standardised airports where passing through is combined with waiting. The two artists have imagined the printed correspondences in three dimensions, accepting the degree of errors due to the parametric process. In quantum physics it is said that a particle can be simultaneously here and there, which is precisely what seems to happen during the conversions of images into objects. 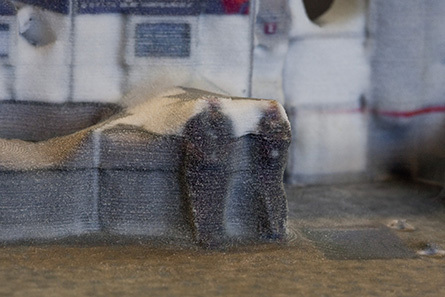 Since the 3D printer, in the duration of its interpretation, seems to have confused the particles that are passing through with those of the seats and the walls. The world of Caroline Bernard and Michiko Tsuda has liquefied somewhat during the fabrication process. As for algorithmic errors, it is those that make the work. 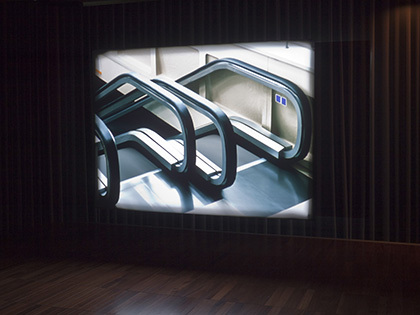 Lastly, there is an exhibition by Thomas Demand at the DHC/ART. His photographic and filmic images have a strangeness that one struggles to define. Something intrigues us without our knowing exactly why. Is it of the order of absence or of perfection? There are neither humans nor use, not even dust. But they all have, apart from this shared strangeness, stories of their own. The German artist draws upon the media and the Internet. He then meticulously produces the decors of these scenes of news or political stories in cardboard and paper, going as far as prohibiting himself from using paint. There are then places that we think we recognise, though we need to exercise our memories. These full-scale models that are made in the studio are always destroyed. Consequently, nothing remains of the three-dimensional transitions necessary to the fabrication process of the images and photos. The strangeness of Thomas Demand’s representations is born precisely of the imperceptible distance that separates us from the real, if only to bring us closer to the facts. Written by Dominique Moulon for Digitalarti and translated by Geoffrey Finch, June 2013.